In April 2016, the "bauma" international trade exhibition in Munich will become the central hub for the entire construction industry, attracting industry professionals for the purpose of exchanging information and further education. 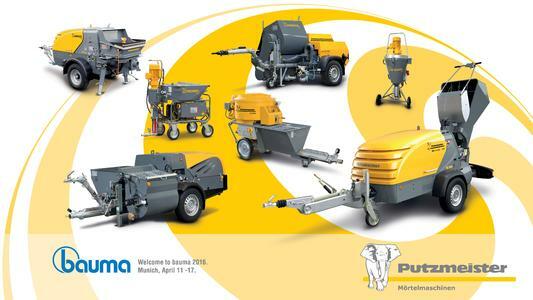 Well-known exhibitors such as Putzmeister will present established technology, innovations and further developments from their wide range of products for the cement and screed conveying sector, for example, to specialist personnel from both the domestic and overseas market. The in-house engineers and specialists at Putzmeister focus on the challenges that customers face on the construction site every day. 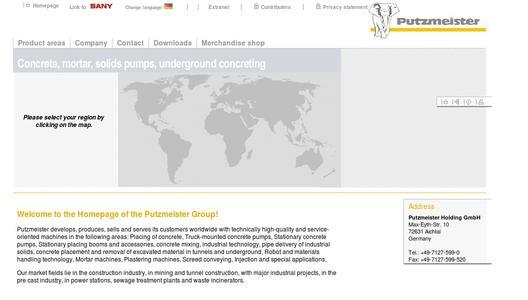 Putzmeister is an internationally operating company that consistently focuses on quality "made in Germany".The main assemblies and drive components of its cement and screed conveyors are a product of German development and manufacturing. If any components from our durable, hard-wearing machines need replacing, the global Putzmeister service network ensures maximum availability of spare and wear parts. Furthermore, more than 130 Putzmeister employees in the mortar machine division alone work tirelessly to ensure that Putzmeister technology is better equipped to overcome any practical issues and daily challenges encountered on the construction site. This powerful package for large-scale screed jobs is fitted with a new control cabinet with an innovative display screen to make handling easier for the operator. An easy to read fault rectification and service menu is installed in a well-protected location under the hood. Another new feature is the operator panel, which is fitted with an 8-button keypad incorporating blue, green, yellow and red LED indicators. The colours represent specific messages and information: Blue means "operational assistance", green "command executed", yellow "command selected, not yet executed" and red "command cannot be selected, is locked or error has occurred". The development of the M 760 is topped off by the new compressor unit powered by a Kubota diesel engine from emission category 3B. With an enhanced power of 48.5 kW at 2,700 rpm, the engine is cooled by a new water cooling system that replaces the current oil cooling system to increase efficiency while simultaneously reducing emission and noise levels. The overall fuel consumption is also lower. The original unit is now available with a cutting-edge Kubota diesel engine from emission category 3B. Lower emission levels and a simultaneous increase in efficiency combine with other advantages such as a high degree of availability, long life and the precision metering of aggregate and binder to ensure a consistently high quality and provide an analysis of recipes and processed quantities for the manufacture of high-quality floor coverings. The TransMix can be configured according to the individual needs and requirements of the user, whether they be self levelling floor screed, insulating fill or conventional screed. The original 1968 machine has been continuously developed for more than 50 years and offers almost unparalleled configuration options for all screed professionals. Putzmeister has launched the FE 400 successor to the FHS 200 hydraulic liquid screed pump for self levelling floor screed to coincide with bauma 2016. The new EstrichBoy FE 400 still offers the many advantages of the FHS 200, such as a forward and reverse operating auger pump. The standard radio remote control for infinite regulation of the delivery rate has been redesigned and now allows the machine operator to control the EstrichBoy from even further away. One other additional feature is the hard-wearing, robust plastic hood on the FE 400. The more professional design of the new FE 400 model and improvements to the high-pressure cleaner provide better access to all mechanical components, in particular the auger pump. As a result, all maintenance and cleaning operations are easier to perform and allow the operator to work more quickly and ergonomically. Globally top-selling screed conveyors from the Mixokret family, including the new M 760 DH (basic version) with 3B Kubota engine and the established M 740 DBS (with hydraulic loader and scraper) as well as the diesel version of the SP 11 LMR from the auger pump family and the S5 EVTM as an electric version with mounted plate mixer. 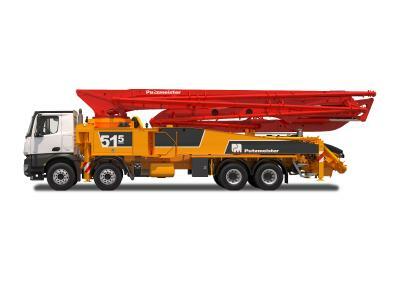 A P715 D piston pump with roadworthy T-chassis and optional lifting eye as well as the MP 25 as an all-round Putzmeister mixing pump will also be exhibited. The DC 450 DBS version of the EstrichBoy - a genuine all-round genius from Putzmeister - will be presented at the bauma exhibition. Eagerly awaited by industry professionals, the "FE 400" successor model to the Estrich Boy FHS 200 will be presented at bauma for the first time. One eye-catcher in Munich will certainly be the TransMix 3200 with Kenworth Icon 900 tractor unit: The semi-trailer for self levelling floor screed incorporates a powerful auger pump at the rear that delivers a permanent flow of material with a maximum particle size of 12 mm to any placement site at a top rate of 18 m3/h. Materials are metered automatically to ensure that the screed quality remains consistent throughout the entire delivery process. Each TransMix is a unique specimen whose configuration can be adapted perfectly to suit customer requirements and the specific materials being used. The Putzmeister Group develops and produces machinery of high technological quality in the fields of concrete conveying, truck-mounted concrete pumps, stationary concrete pumps, placing booms and accessories, plant technology, conveying viscous industrial materials through pipes, concrete placement and transporting excavated material from tunnels and below ground, mortar machines, plastering machines, screed conveying, injection and specialist applications. Market segments include the construction industry, mining and tunnelling, large industrial projects, power plants, sewage treatment plants and waste incineration plants all over the world. The company is based in Aichtal, Germany. With approximately 3000 employees, the company achieved a turnover of roughly 691 million euro in the 2014 financial year.